A blog about all things Vegan. Love life, love food. A couple of Saturdays ago my friend Siobhan and I got the train over to Leeds for the Yorkshire Freefrom Show. Just look at the majestic surroundings of Leeds Town Hall! The first thing I noticed when I got there was how much smaller the fair was than the big Manchester, Bristol and London ones I had been to in the past but do you know what, that suited me much better. Another nice surprise was that the majority of stuff there was vegan! I was expecting a lot to be gluten free but not necessarily vegan but that wasn't the case. 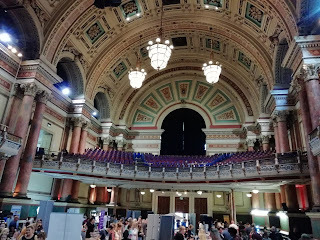 There was a nice steady flow of visitors but it wasn't horribly rammed like some fairs I've been to and it was great to have chance to chat properly to stallholders. It was also good to see a wide variety of smaller businesses that were new to me. Sales, bargain hunting and my new favourite crisps! Lucy Bee is a brand that's been on my radar since I was a reviewer for Can I Eat It App as a few years. They are a really ethical brand, supporting fairtrade farming and not using monkeys in the production of their coconut products. Added to that their products are excellent quality. I don't usually go on mailing lists for brands but I've been on theirs for a while and they have pretty good newsletters. A few weeks ago one arrived with news of a sale. Recently they've branched out from coconut oil into other areas and good bargains were to be had as they are re-branding their products. Here is the link if you are interested. The items I chose were around half price. 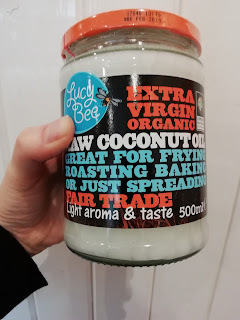 This huge jar of coconut oil was £5 and the cacao was £3. We seem to get through a lot of cacao so I got a couple of these! We were over in the nearby town of Ashton-under-Lyne last Saturday where Matt was playing in an afternoon festival. I took the opportunity to pop into one of my favourite discount shops whilst we were there. Fultons is a Northern chain that sells both frozen and non-frozen goods that are coming to the last few months of their shelf life. I've always found some great vegan bargains and this visit was no exception. 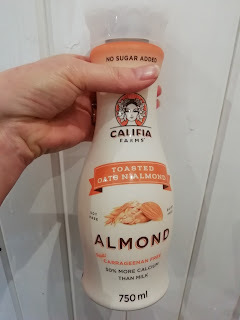 The price of Califa Farms almond milks has always put me off. They are around the £3 mark but for 69p I snapped this up and used it in our Sunday smoothies. Weekly roundup - superseeds, cheese and cornettos! I've been continuing with sprouting seeds. 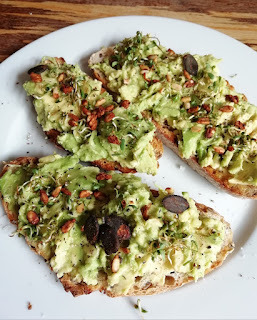 This avocado toast is topped with homegrown alfalfa and I've had good success with sprouting red clover seeds this week too. Alongside the alfalfa sprouts the darker seeds on here are the Activated Sunseeds with Shitake from my recent Raw Living order which are my absolute favourite salad topper. The flavour of these things is incredible and elevates a simple meal into something gourmet. Talking of gourmet we tried some hand made artisan cheese from Manchester based vegan cheese maker The Walnut Gatherer. We've tried a few flavours now with the garlic being my favourite so far but this red pepper cheese was lovely too. We've been rationing ourselves to a little at a time as it gets even better as it ages. I've started sprouting again! In my old flat I used to do sprouting all the time. The flat was in an old 1930's building and had radiators run from a central boiler room and it was always nice and warm. The constant warm temp made sprouting pretty fail safe. Now I'm in a Derbyshire stone house where it's not as warm the results haven't been as great and I gave up trying but with this very hot summer we are having I thought I would give it another go and I'm glad I have done. As I already have the seeds it kind of feels like free food too! I'm using these sprouts from A Vogel. I'm going to start this week with a couple of bargain hauls. Our Co-Op supermarket is closing down and the premises will become a B and M Bargains. It's sad because it's in a great location right next to the train station and it could have been a fantastic store but unfortunately it's been left to get more and more run down over the years and no money has been invested in it. It's frustrating when we go to other places and see the new style Co-Ops and see what it could have been like. I feel so sorry for the staff and also the post office who share the building is now under threat and have a year to find a new location. As a result of them closing a lot of the stock has been sold off at clearance prices. I picked up coconut sugar, cacao powder, maca and goji berries that were around £1.50 each. These will be very welcome in our breakfasts over the next few months.